Debut full-length from San Diego-based Plastiq Phantom collaborator presents a static-swept symphony of enveloping melodies. Anyone can stream hard drive glitches to CD-R, but few people can channel emotion. 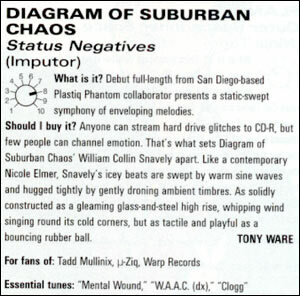 That's what sets Diagram of Suburban Chaos' William Collin Snavely apart. Like a contemporary Nicole Elmer, Snavely's icey beats are swept by warm sine waves and hugged tightly by gently droning ambient timbres. As solidly constructed as a gleaming glass-and-steel high rise, whipping wind singing round its cold corners, but as tactile and playful as a bouncing rubber ball. Essential tunes: "Mental Wound," "W.A.A.C. (dx)," "Clogg"